A little acrostic poetry for your Wednesday morning. To get more great content from These Small Wonders, follow us on social media or subscribe to get email notifications with new posts. This post is directly addressed to anyone who will face the question: what does my child’s disability say about me? About my life? If that is you or someone close to you, you know the intensity of the question. But we of the diagnoses aren’t the only ones who wrestle intensely with the hard questions of life and identity. The deep soul searching incited by our touches with disability comes from a place which exists inside us all. Crises of the self are common to all of humanity. So, indirectly, I suppose this post relates to everyone. To attempt an answer to our question, I’ll tell you a story. Heath White is a former Air Force pilot who currently works for the FBI. In his free time, he raises cattle with his family at their home in East Texas. He also runs marathons while pushing wheelchairs loaded with people who cannot run on their own feet. I was introduced to White through an ESPN E:60 feature about his running which went viral a few years ago. 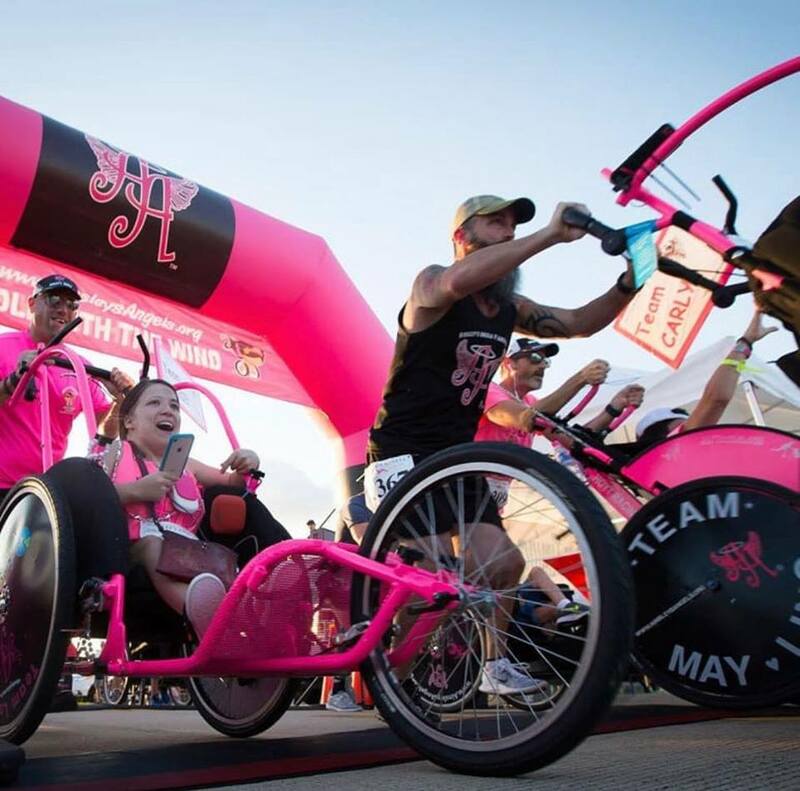 He is a man in motion, full of energy and exuding love for people with special needs, especially his daughter Paisely. When I contacted him to talk about the story, he was more than willing to give away his time – “I’ll do anything for the community.” You believe him when he says that. He’ll drop everything to take a phone call or book a flight to support an event, anything, if he can help a person or a family with special needs. He strikes you as a man who knows who he is and lives with purpose. If you only knew Heath a decade ago, you probably wouldn’t recognize him today. That’s exactly what Heath wanted. The perfect life, an enviable life. And it was unfolding around him. It was unfolding perfectly, until, in one disastrous moment, an unforeseen variable entered the equation and threatened the whole perfect formula. A flagged ultrasound during the Whites’ 2nd pregnancy led to an amniocentesis test which revealed the marks of an extra copy of the 21st chromosome. The little girl in the womb showed undeniable signs of a disabling error in her DNA. There was a glitch in the transmission of the Whites’ healthy, beautiful and successful genetic coding. The news was unbearable and unacceptable for Heath. A man reared in the world of cattle, he knew that when there is a flaw in the offspring, the bull takes the blame. 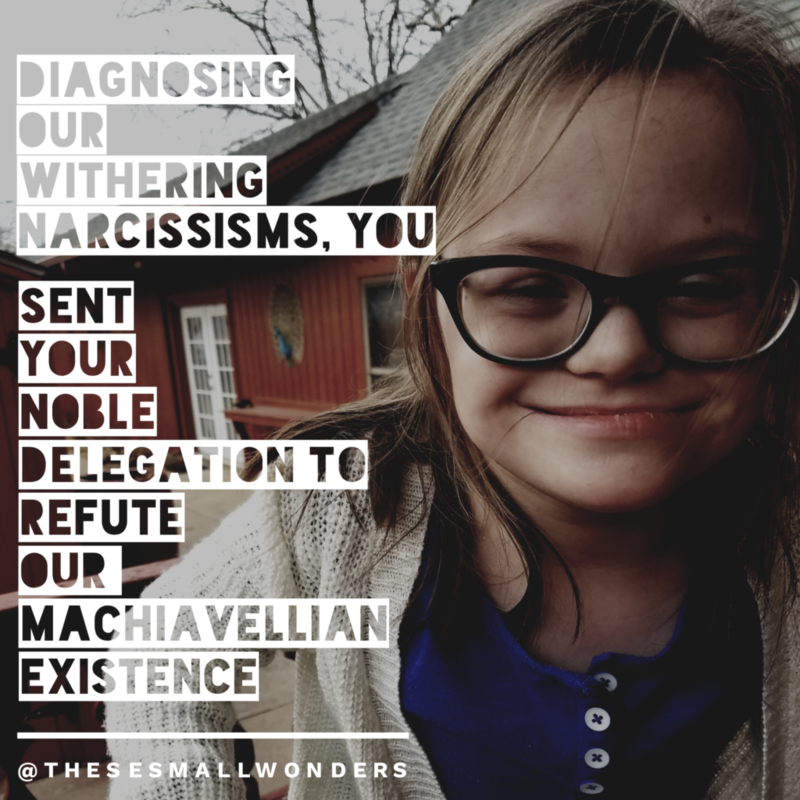 The news of his daughter’s broken genetics was a tarnish on his image that he couldn’t tolerate. His reputation as a winner, big time stock, was on the line. So Heath did what many in his shoes have done. He demanded an abortion. White is not alone in his reaction to the unwanted imposition of disability into his life plans. 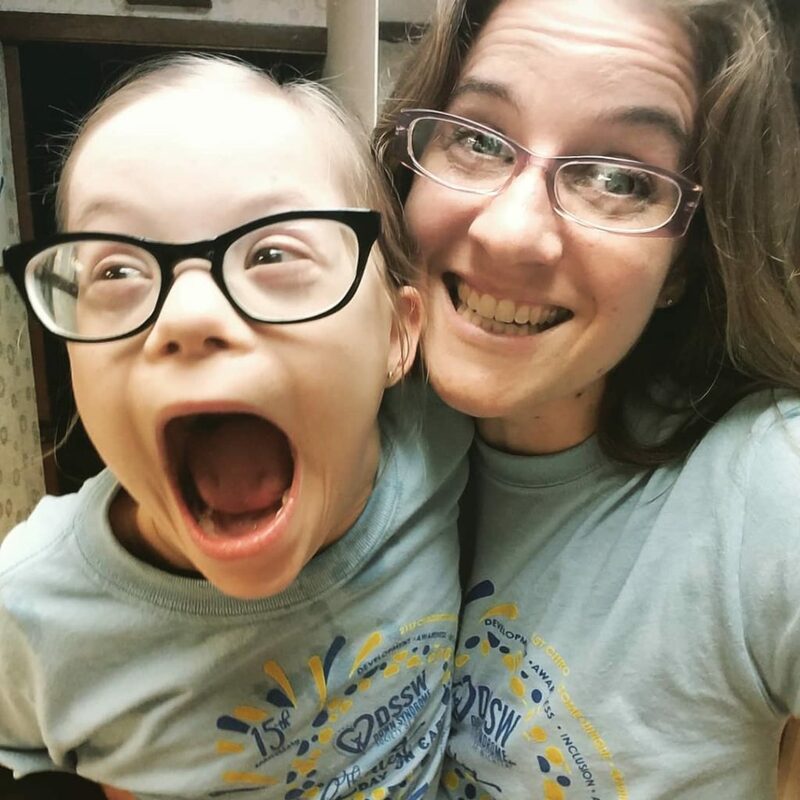 The realization that my daughter was disabled came with a singular shock in my own life. Before Elizabeth, I had only seen Down syndrome from a distance, as an abstraction, but nothing more. Then my daughter slipped through the prenatal testing gauntlet to crash into our world with a face unlike anything we imagined. That morning, when I held my daughter in my arms, I looked into the eyes of Down syndrome and, for the first time, it was mine. It belonged to me. It appeared out of nowhere and suddenly, irrevocably entangled itself into the fabric of my heart. Down syndrome, disability, was no longer a concept ‘out there’. It was my daughter, my family, it was me. That mind-altering realization comes haunted with a question. What does this say about me? What does this say about my life? Most of us carry an image of an ideal identity, the perfect life. We spend massive amounts of time and energy building our lives around those images – Successful. Wealthy. Beautiful. Strong. Free. But behind those structures we build, other images linger. Darker ones we don’t want to think about and from which we will run at all costs. Weak. Unattractive. Unwanted. Unworthy. Trapped. It’s hard to tell which is more motivating – the promise of perfection or the threat of imperfection’s exposure. In the age of digital personal branding, the pressure to achieve the ideal can be enormous. Whether we are running from or running towards an image, as long as we are running, we’ll never know who we really are. Our lives will not be authentic, and therefore they will be fragile. Maybe this is one of the things that makes a diagnosis of disability so emotionally crushing. Looking back, he describes himself in those days with two adjectives his former self would never have admitted to: scared and selfish. Running from his fears, running from the terrifying prospect of weakness, he demanded the termination of what he could only perceive as a threat. You can imagine the tension his response created for Heath’s wife, Jennifer. Her husband meant the world to her, she understood and shared his pain, yet ending the life of the child in her womb would set her against everything she valued and believed in. In the end, after agonizing hours of deliberation and prayer, she gave him her answer – “get on board and be the man you should be or leave.” My child will live. The unmovable will of a mother won the day and a few months later the couple came face to face with their daughter. Paisely White. A soft little ball of humanity who came into Heath’s life like a blast of dynamite – shattering the facade of a perfect life. Leaving a pile of broken pieces. As Heath tried to come to terms with his new reality, one moment opened his eyes to an entirely new perspective and provided a framework to rebuild a life. One very ordinary day, while tickling Paisely, he noticed that she giggled and struggled to push his hands away just like her older sister. In that moment, Heath’s grip on his dream life and his resistance to the imperfection of his daughter’s genetics broke. That was the beginning of an epic transformation. Having faced his fears and accepted his losses, Heath was free to truly see his daughter, not as a threat to his identity, but as his beloved child, a unique and captivating little human who had stolen his heart. And he had to tell the world about it. So he decided to run a road race with Paisely and publicly declare his pride for her. Together, they ran a 50k ultra-marathon. They came in 2nd place. A few days after the race, Heath got a phone call from a producer at ESPN. “Yeah right, this is ESPN.” It really was ESPN, and they wanted to feature the Whites on E:60. Heath got his chance to show off his little girl – to millions of people, all over the globe. Today, Heath no longer runs with his daughter. 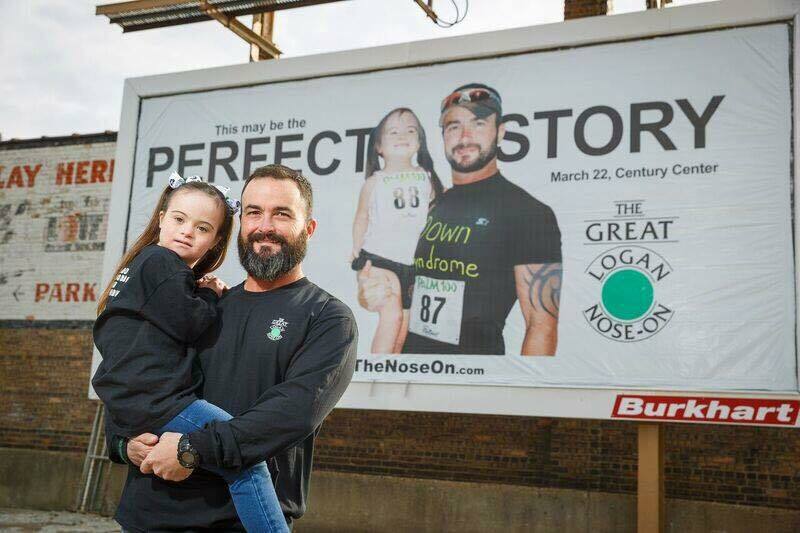 When he and Paisely reached an impressive tally of 321 miles together (the numbers representing 3 copies of the 21st chromosome), Heath realized that he had accomplished his goal for the races. After the thrill of running with the kind of purpose he had found with Paisely, running solo just didn’t offer the satisfaction it once had. So he found others with special needs who wanted to experience the joy of racing and added new partners to his team. One of those partners is Gabby, a girl with Cerebral palsy who was featured on another E:60 piece. After seeing her story, Heath contacted his producer to make a connection. When Gabby’s Mom watched Heath’s video, her initial reaction was “I don’t want to talk to him. That guy’s a jerk!” But she gave him a chance and, to date, Heath and Gabby have run 10 marathons together, including Boston. Those are the moments he lives for. It’s astonishing to see the results of this transformation. Heath’s as driven and successful as ever, but he’s using that drive to lift others instead of his own image. A man who was once running, scared and selfish, is now a hero to millions who runs with purpose and conviction, straight towards imperfect people. When you ask Heath what he thinks about when he runs, he’ll describe for you a scene he imagines will take place someday in heaven. This is the vision that drives White’s sacrifices for people with special needs. What does it say about you if you’re child is diagnosed with disability? What does it say about your life? I asked Heath how he would answer the question. You don’t have to be perfect to be loved. You don’t have to be typical to be beautiful. Love is far stronger and more satisfying than anything else you can achieve in this life. It’s a lesson that changes everything. I’d love it if you would help me spread Heath’s story. You can use the buttons below to share this post on social media. To get more content from These Small Wonders, click here and subscribe to the blog for updates. 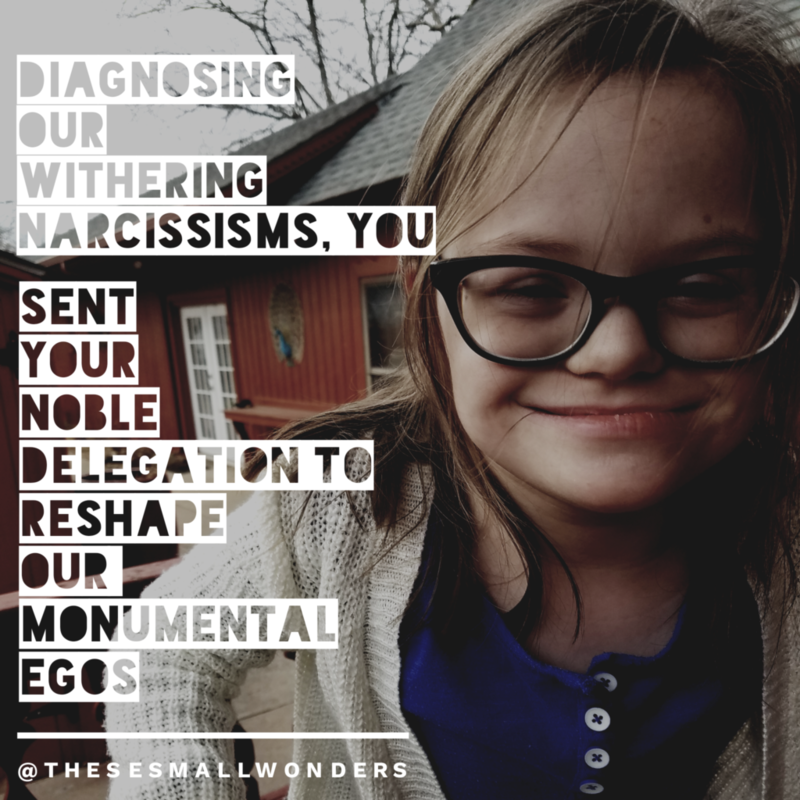 The purpose of this blog is to give expression to my experience – to find some way to explain what my daughter and her disability have done for my life. She has brought massive trials and challenges into my world, but even on the worst days I wouldn’t change a thing. 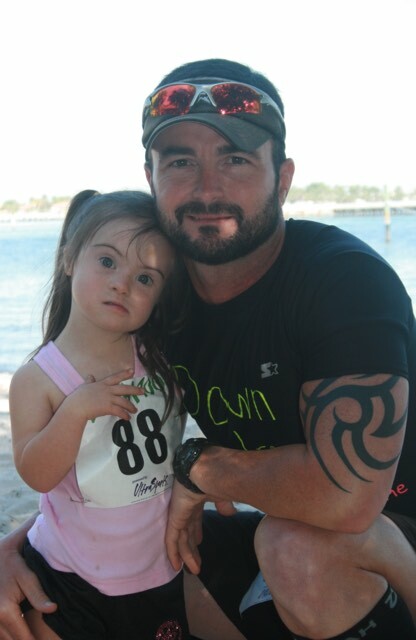 I am without doubt a better man and a more complete human being because of my daughter with Down syndrome. This week I had a fresh realization of her humanizing effect. Sunday afternoon I jumped in the car to get in a workout before the game. I turned onto the river-side drive I have taken hundreds of times to get to the YMCA downtown. As I mentally checked out of the familiar route to plan my time at the gym, I was startled back into the moment by a very unfamiliar scene up ahead. Traffic in front of me was stopped by a person wandering down the middle of the road. A small crowd of pedestrians was gathering on the sidewalk. The person in the street was gesturing wildly while talking heads leaned out of car windows – “you need to get out of the road!” “are you okay?” etc. I pulled up to the scene and saw that the person in the street was a young boy, I’d guess about 10. He was barefoot, unkempt and definitely did not look okay. The heads in the cars turned together for a quick planning session. A woman with a cell phone dialed 911 and I pulled around the corner to get out and try to talk with the boy. I walked over and steered him off of the busy street. He wouldn’t look at me or respond to my questions and he took a couple of swings at me while I blocked his access to the road. As I herded him around the corner I worked through a string of options in my head. Is he in a state of panic? Having a bad day at home? Am I speaking a language foreign to him? Does he have some kind of intellectual disability? The woman who called for help joined me and together we walked up and down the block, keeping our troubled companion out of the path of the cars. After about ten minutes, two of the pedestrian onlookers approached us with a woman following close behind. They had heard a voice down by the river calling out a name and fetched her. When she saw her runaway with us she seemed to radiate a mixture of relief, trauma and embarrassment. She explained that the boy, her step-son, is autistic and non-verbal. She was in the bathroom and he slipped out the front door for an unsupervised expedition. As the boy is fascinated by water, the first place she thought of looking was down by the river, fearing the worst. When she wrapped up her story, the intrepid explorer sat down on the sidewalk, a police cruiser pulled up and I took my leave. Only after leaving the scene did I consider my own proximity to the runaway experience. With a little distance and reflection it seems obvious to me, the Providence in the situation. I was the perfect person to step into that road. Throughout the whole experience I felt perfectly calm. I wasn’t stressed or worried by the uncertainty of the scenario. I didn’t mind the interruption in my busy day or the boy’s violent attempts to take out his angst on my body. I wasn’t frustrated by the failed attempts at communication. It just felt like an interesting challenge to me. Looking back, I realize that, in that moment, I was demonstrating the product of nine years of training. For nine years I have been living with a child who doesn’t use many words and is often intensely frustrated. I have been dodging blows and trying to puzzle out invisible needs and desires. I have been living with constant interruptions in my schedule. I am all to familiar with the act of trying to talk down an insanely stubborn and agitated child while a crowd looks on. Sunday afternoon, without thinking about it, I adopted the posture, the patience and the creativity I have learned in adaptation to an unpredictable life at home with my daughter. 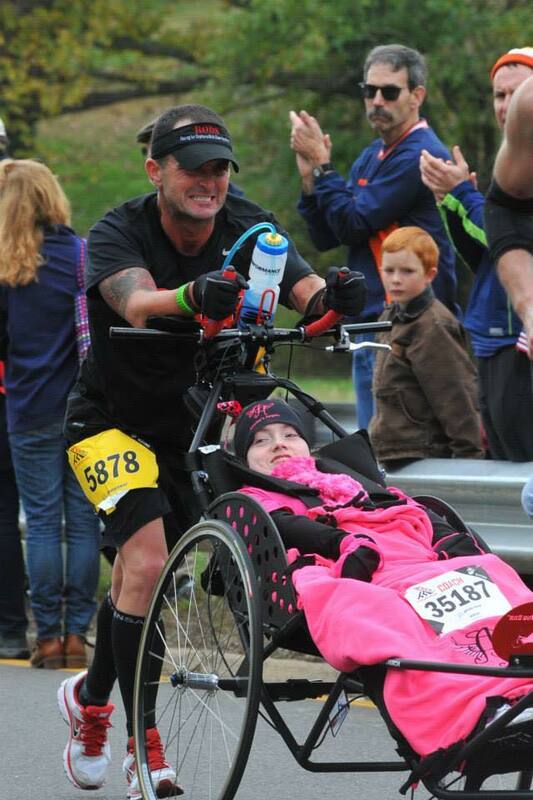 The unruffled composure of that moment – it’s one of the many benefits I have received through my daughter and because of her disability. Naturally I am an anxious person who tends to be a little jumpy, especially around nonverbal strangers gesturing wildly in the street. But things have changed. A person who is anti-fragile meets unexpected difficulties as benefactors and gains power and stability from them. 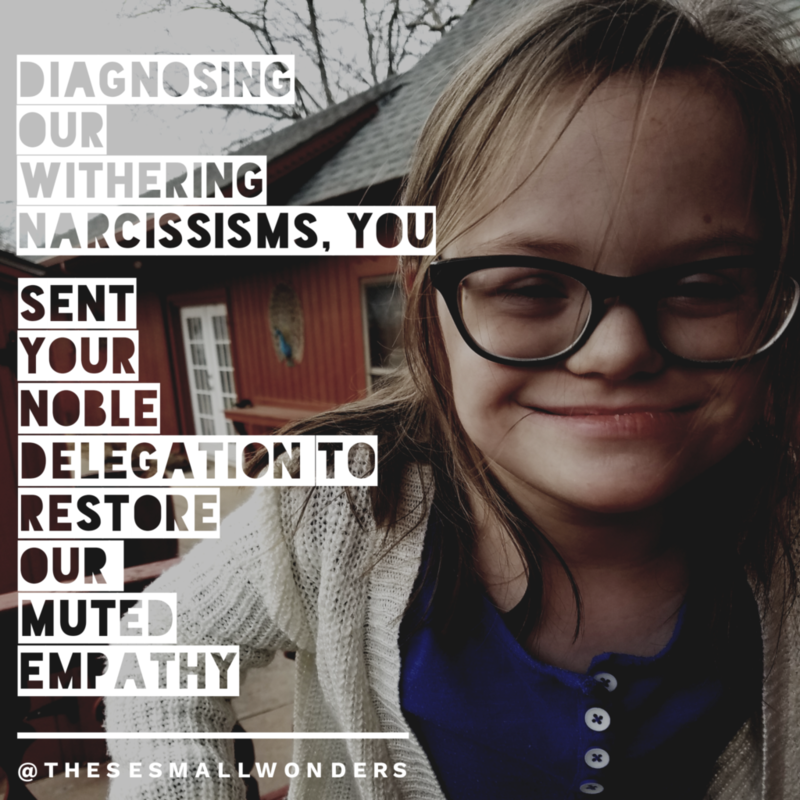 An anti-fragile person sits in a doctor’s office while their child shouts with hysterical rage and flails savagely at the impertinent strangers who are attempting to shine a bright light in her eyes and walks away from the experience having leveled up in courage. The first time is horrifying. The second time a little less so. You go through enough experiences like this and you realize they’re not going to kill you. They just kind of become routine. And along the way, without realizing it, you are becoming more and more anti-fragile. This is something I have come to admire in parents of children with disabilities. There is a tolerance for the chaotic and the unpredictable that is uncommon and heroic. I have often watched with silent respect as a parent calmly and creatively handles a pickle of a scenario which would cause the average person to flip their lid. It’s important to say what I am not saying here. I am not claiming an angelic or supernatural tranquility that breezes through life several inches above ground and untouched by circumstances. We have very bad days in my house, days with new challenges and new recurrences of old challenges that make us want to throw in the towel. What I am saying is that those days we dread so much don’t weaken us, but tend to have the opposite effect. The bitter buds of difficulty and disorder grow up into the sweet flowers of toughness and tenacity. Talib laments the tendency we have in our modern world to mitigate risk and eliminate variables. Experience shows us that the more we attempt to control our world, the more fragile we become. This isn’t a problem for most of the parents I know who are blessed by disability in their offspring. There’s a point that comes pretty quickly when you give up. You can fight the wave or you can turn around and ride along. There will be no control. Your child will throw an iPad into the washing machine to take a spin with the whites. She will gleefully stick her face into the perfectly frosted cake you’re about to take to an event. She’ll throw her glasses onto the basketball court during her brothers’ basketball game and her road ID into the lions den at the zoo. She’ll slap the new person sitting next to you at church in the face, take a sip of their coffee and then chuck her bowl of Chex Mix into the next pew when she decides snack time is over. There is no predictability. There is no control. There is only chaos and surrender. And that surrender to the chaos is the beginning of our anti-fragility. Don’t you think we all could use a little more anti-fragility in this crazy complex world of ours? For that and a thousand other things, I thank God for my unpredictable little girl and salute my fellow anti-fragile parents. And I pity the inevitable fragility of the family or society which chooses to eliminate a potential source of disorder and strain in the misinformed belief that they are securing control over life.